Alison (3rd Grade): "I would like it if it were interesting." For many kids, math equals boooooring. It’s abstract and lifeless. So, how can teachers make math come alive for kids in the classroom? Michelle Reel, a 6th grade math teacher in Indianapolis, figured it out. She runs a “mini-economy” in her classroom. You see, money is always...well...interesting. No kid ever nodded off in class while buying stuff and counting money. I am a 6th grade math teacher. I have run a mini-economy in my classroom for years, but the “bank” has been a problem. I’ve tried several different methods of creating a bank that will work with 150 kids, and I’m stumped. I really believe in the value of financial literacy — and 6th graders need to understand that math IS used outside the math classroom. So... any chance I can use your program as my bank for the next school year? I’d love to talk to someone about how we can make this work. Yes! 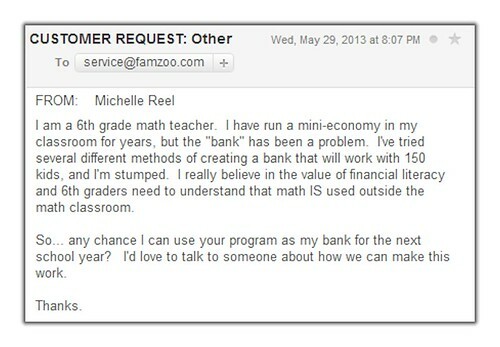 We were delighted to help Michelle tackle the classroom banking problem. 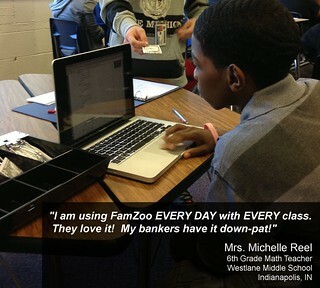 So, we set her up with some coupon codes to cover FamZoo virtual family banks for each of her classrooms. Here’s the short version of how it works: The student “banker” manages “customer” accounts in FamZoo to track deposits, purchases, and withdrawals. The “customer” students sign in to FamZoo to monitor their individual account balances online as they participate in the classroom economy. Just recently, we checked in with Michelle to see how things were going midway through the school year. The verdict: “I am using FamZoo EVERY DAY with EVERY class. They love it! My bankers have it down-pat!” Nice! I work in a “high-need” public school in an area of a large city where “urban” and “suburban” crash together, sometimes somewhat harshly. Out of nearly 1,000 students, 70 percent are minority and 60 percent receive a free or reduced-cost lunch. Yet our standardized-test scores in math are always above the state average. I believe that is because the teachers at my school do everything they can to make math meaningful. Making these concepts something more than just abstract topics requires some creativity. That’s why I started integrating financial literacy into my lesson plans. Decimals lend themselves to teaching all operations with money, from balancing a checkbook to everyday transactions to — for those students in families with loftier financial concerns — fluctuations in stock prices. Teaching percentages allows for a discussion of taxes, sales, commissions and tips. Integers — positive and negative numbers — are a natural fit with debits and credits, the red ink of owing money and the black ink of earning it. To activate this in my classroom, I run a basic “mini-economy.” Students are told the first day of school that they will be “paid” for working in my classroom. As employees, they make money every time they walk in the door prepared for class; they make more if they participate; and even more if they pick up a supplementary classroom job. Every student earns money and every student can spend it. I have a classroom store stocked with supplies (no excuse for not having a pencil for my class). Students may purchase “special” seating and extra credit as well. This year, FamZoo will help make possible a component I have wanted to add for some time: philanthropy. Students will be able to donate their money to charitable organizations. At the end of each quarter the money that has been donated by my students will be matched by a parent or organization so a real donation can be made. (Not too many charities could make use of the fake money that my students use.) My students will have the chance to pick the charity, and we will have some really valid conversations about the idea of “giving.” My husband and I are going to match my students’ giving for the 1st quarter and I’ve talked to our school’s PTO and I’m talking to many parents as I look for others to help us for 2nd, 3rd, and 4th. Last year, my students had a return rate of 93 percent on homework. They place a higher value on “doing their math” because they’ve learned that high grades equal more money. They see the value education provides, literally and tangibly. My parents taught me how to save and spend wisely, and how to plan for the future. Unfortunately, too many parents don’t — or can’t — teach these lessons. The financial literacy that comes from my class “pays off” in greater motivation, greater understanding and greater financial futures. Now that’s an inspiring program, and we’re honored to be a small piece of it. If you’re a parent who would like to see this kind of program rolled out in your child’s classroom, please share this post with a local teacher. If you’re a teacher who would like to try FamZoo in your classroom, please contact us. We’d love to help. More about Michelle: Michelle R. Reel is a veteran Master Teacher and Chair of Mathematics at her school, where she’s spent the last 15 years. In her spare time, she tries to train three cats, two dogs and one husband. At least she’s successful in the classroom. That is awesome! My wife taught math (and science) for ten years. I know how hard it is to get kids to engage. Bravo to Ms. Reel for her pursuit of relevant education! Bravo to FamZoo for doing your part to support that effort. I will forward this on to the educators that I know in my San Diego community. I have know Michelle her life. She is a dedicated & creative teacher who truly loves her students. She just told me that her kids have donated $1300 to charity for this 1st quarter. Congrats to them and to her for their generosity and hard work! Wow, that's fantastic! Thank you for sharing that milestone. I hope charitable giving sticks as a lifelong habit for the students - along with smart earning, saving, and spending habits. Kudos to Michelle and her class!